What is Mindfulness helpful for? What should I expect on a Mindfulness course? Mindfulness and Meditation are terms that are often used interchangeably and a third term Mindfulness Meditation is also found in common usage. These terms all relate to similar practices, most of which involve learning to pay more attention, in a deliberate and focused way, to a specific object, such as the breath or sensations in the body. While we generally tend to associate meditation with sitting still, we can bring mindfulness to any daily activity, such as eating, driving, even washing the dishes . Mindfulness is a way of being, a way of living day-to-day consciously and with awareness. The practice of Mindfulness is more than 2,000 years old and can be found, in some shape or form, in most of the major world religions. However, it is not a religious practice in itself. People who are committed to their own spiritual development or faith practice often find mindfulness to be complementary to this but mindfulness can be practised by people of all faiths and none. Is Mindfulness beneficial for me if I am receiving treatment for anxiety and/ or depression? The Mindfulness Based Stress Reduction Programme (MBSR), in particular, has been designed to support people experiencing a whole range of physical and mental health conditions. In more recent years, the MBSR programme has been adapted by others working particularly in the area of mental health and often includes components of cognitive therapy. Reports from this area of work clearly indicate that the MBSR programme can greatly assist those experiencing psychological distress, including anxiety, panic, depression, fatigue, and sleep disturbances. Having said that, participating in a mindfulness course, particularly MBSR, can be challenging and there are times in our lives when this kind of challenge may be too much for us. If you have any concerns about your ability to engage with a mindfulness course at this particular time, please feel free to discuss them with me. Together, we can assess whether this is an appropriate time for you to take part in a course. Is Mindfulness the same as psychotherapy or counselling? While we can learn a lot more about ourselves and develop greater insight into the patterns we have developed over many years, mindfulness practice is not about individual or group therapy. In the courses offered by Susan, support is offered to participants to learn and develop a practice of mindfulness but this is different to the kind of therapeutic support that might be offered by a counsellor/therapist in a group therapy setting. Having said that, those already engaged with a therapist or counsellor often find mindfulness practices to be very supportive of this process. No! Mindfulness can be practised just as easily whilst sitting in a chair, standing or even lying down. It is useful to remember that a lot of meditation practices originated in Eastern countries where people are used to sitting on the floor as part of their daily lives. For those of us in Western countries, sitting in chairs is what we are generally more used to and we tend to have less flexibility for floor sitting. Having said that, during mindfulness courses, I have a range of meditation cushions and meditation stools available so that participants can, if they like, experience sitting a bit closer to the ground! What should I wear when I attend a Mindfulness course? As the practices involve paying attention to our breathing and doing some gentle movement, it is best to avoid clothing that is tight around the waist. Comfort while taking part in a mindfulness class is really important so loose clothing works best. Are there programmes available for young people and children? Yes, there are a lot of developments in this area of mindfulness work and the value of developing mindfulness programmes for children and young people has been recognised by many people working in the fields of education and health in particular. 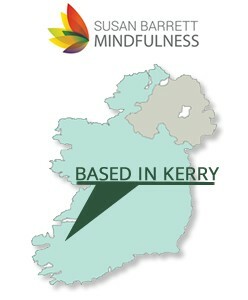 Currently I am focussing on providing courses for adults in Kerry but I would be happy to direct you to mindfulness resources that available for children and young people. Please also check my useful links in the sidebar of this page for further information in this regard. Those involved in teaching and youth work often acknowledge that they too could benefit from taking part in a mindfulness course so please get in touch if you would like to consider this as an option for you or your team of colleagues. I’d really like to do a Mindfulness course but I’m currently on a low income? Flexible payments options for courses can be accommodated and on each course, a number of concessionary places are available. These are generally offered to students and those in receipt of Social Welfare payments. However, I am committed to making mindfulness courses as accessible to as many people as possible so if you would really like to do a course and are on a reduced income, please contact me to discuss it and I will do my very best to accommodate you.